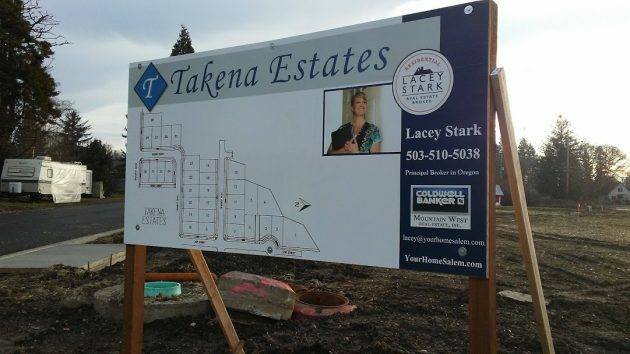 Ready for 32 single homes to be built: The Takena Estates subdivision west of Hop Street. Home building in Albany has slowed a little this year just as the Oregon legislature is trying to encourage more housing to be built. And the legislative pressure for more may increase next year. 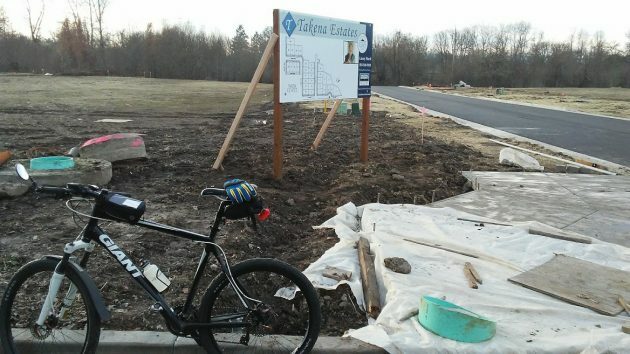 I was wondering about the pace of construction activity the other day when riding around on the freshly paved streets of Takena Estates, a new subdivision at the western city limits, between Hop Street and the old Oregon Electric track. The developer there has prepared 32 lots for single-family houses. Whether zoning for single houses will continue to be allowed is now uncertain. Oregon House Speaker Tina Kotek, D-Portland, will introduce a bill in 2019 requiring cities of 10,000 and bigger to allow up to four units per lot on any land zoned for single-family housing. That would be on top of the 2017 law requiring cities and counties to allow detached accessory dwelling units on all single-family lots. Albany has yet to comply with that mandate because the mayor vetoed a code change to that effect. In Albany, the city in 2017 issued building permits for 187 single homes with a total estimated value of about $47 million. With this year almost over, the totals for 2018 are 129 homes with a estimated total value of $34.9 million. I got the numbers this week from Matthew Ruettgers, the development services manages at City Hall. If you do the division, you’ll notice that the value per new house this year was about $270,500, up from about $252,000 in 2017. In apartments, the story is different. The city permitted four apartment buildings each in 2017 and 2018. But the estimated value of the permits this year is $7.6 million, up from just under $4.8 million last year. I should have but didn’t get the number of units. But the value boost indicates the number of permitted apartment units this year is bigger than last year. Looks like you have a typo on the total value for 2017, $4.8 million should probably be $48 million. Then the math works out! I hope the law passes for not zoning exclusively for single-family dwellings, After all, when it came about years ago, it was to effectively keep blacks out. We need affordable housing. If I understand the Kotek proposal, it’s aimed at dropping single-family dwellings from urban planning. Not sure how to parse out the effects. For longer than my 70ish lifetime, the plan was to leave rental housing and own your own. Everybody has to live somewhere that they can afford. I was able to buy my own place because I earned enough to do that. That’s no longer a cinch fit. My quarter-acre retirement villa is enough for me to maintain. The 1 acre and 5 acre sites outside the UGB got written off early in our search. Dipped if I have an answer. Real estate development is highly sensitive to economic conditions. Higher Interest rates tend to depress construction until they stabilize. Lack of increase in real wages is a big depressing factor in affordability. Rising unemployment is huge, but hasn’t happened yet. It’s called a recession and by most measures one is overdue. Add in the loss of confidence in the United States around the world and rising costs due to US imposed tariffs that WE pay for, and you have a deteriorating situation. Hering’s back-handed compliment to Tina Kotek seems misdirected. If I read the tea leaves correctly, Hering seems to advocate for more single family dwellings spread further and further out into rural areas, thus forcing expensive construction of new roads, new sewers, new electrical grids, new streets, new schools, etc. All this newness then triggers more cars, more trucks, more noise, more pollution and all the other ills of society. At minimum, if we adopt to more densely-packed residential housing, at least all the problems delineated above would be confined to locales already infected by the unstoppable human infestation. If you think we have traffic problems now in N. Albany, wait until Tena Kotek’s high density housing mandate takes effect. Traffic problems aside, my observation after living 50 plus years in Albany is that single family home ownership is the key to Great Neighborhoods. Those who yearn for high density housing should move to Chicago or Detroit. This bill that Tina Kotek if proposing is doing more than “ALLOWING MULTIPLE DWELLING UNITS, it has the intent to PROHIBIT SINGLE FAMILY UNITS” something far more damaging. Home ownership should be encouraged, being under the sovereignty of a land lord is fine for your first home, but everyone should have an opportunity to own there own home. This type of policy shift is regressive taking away the opportunity to build wealth and favoring the very 1% that these progressive policies claim to be protecting the 99% from. Allowing small lot subdividing to create more affordable housing, town homes, condo’s and ADU’s make good sense in dense urban centers. Forcing apartments and plex living units that only property managers and real estate investors can afford should not be made public policy. Otherwise, you have ideas that rational people can debate. I’m concerned about the State of Oregon generally having too much power over local affairs, but undecided on this case. 1 – Restrictive zoning and on-site-parking requirements consuming too much land. 2 – Real estate investors, as you mention. Tax laws favor them (capital gains vs real-work income and payroll tax, with the biggest difference for those at the high end). Encourages speculation which raises prices for new would-be home owners, and unsustainable “appreciation” which helped create the 2008 disaster.